Construction could be underway ‘by March 2019’. A MAJOR new shopping centre at Curra is intended to become the town centre for an area from Lower Wonga to Gunalda and the fast-growing Curra district. Mr Hoskinn called for public input when he first announced his intentions in April last year, presenting the idea to both Gympie Regional Council and the Department of State Development, Manufacturing, Infrastructure and Planning. Now it is largely a matter of the authorities looking into a report commissioned by Mr Hoskin’s firm, Curra Town Centre, to assess economic viability and need. A planning submission prepared by Gold Coast town planning and landscape architecture firm McLynskey Planners Pty Ltd said the report concluded there was a need for both the shopping centre and a child care centre. The McLynskey submission says the proposal “for a small to medium shopping centre in the Curra township has been in the planning stages for a considerable period of time”. “The make-up of uses has been guided by an Economic Needs Assessment,” it said. The proposed shopping centre would be combined with the Puma service station and convenience store on the other side of David Dr. It would give the area an urban heart, with medical facilities, a pharmacy, bottle shop, fast food outlet, a supermarket and other specialty stores. The eight specialty shops could include a bakery, dental surgery, butcher and professional offices. A small cafe would cater mainly to the local community, the planner’s report says. It would also add to the community amenity already offered by a licensed club, also on the other side of David Dr, playing fields and a rural fire brigade station. “We’re still negotiating with possible tenants,” Mr Hoskin said yesterday. It is estimated the child care (or early learning) centre would save many Curra parents two journeys to Gympie a day, at 15km each way. A supporter of the project said this would mean a 60km saving each day, or 300km a week. The centre would cater “for a minimum of 75 children”. The fast-food outlet provision is hoped to attract “possibly one of the larger chains requiring highway exposure”. 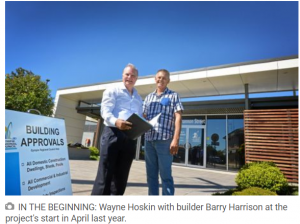 Mr Hoskin said council and government processes would now run their course and it was hoped residents would see work getting started by April next year.